With more than 50 entirely customizable weapons, the weapon creation process in Tom Clancy’s Ghost Recon Wildlands is a central element in the game’s development. In order to allow the player to handle the most realistic weapons possible, many passionate and dedicated teams from Paris and Bucharest collaborate on this subject. These teams are made of game designers, gameplay programmers, FX artists, and sound designers. Research is done by the game designers. They collect all the information they can find about a given weapon, thanks to multiple sources and especially regular contacts with the Ubisoft Authenticity team at RedStorm Entertainment: version types, dimensions, caliber, manufacturing materials, coating, moving parts, compatible attachments, interior parts...and also gather true weapon demonstration videos. The team also had the opportunity to go to a shooting range to try the game’s weapons under real-life conditions, and feel how the weapon’s rate of fire, weight, recoil or sound works. According to Mihai Zorca, Technical Director at Ubisoft Bucharest: "No matter how detailed pictures can be, holding a weapon, examining its parts up close, firing it, gives you a different perspective on the models you’re about to create." 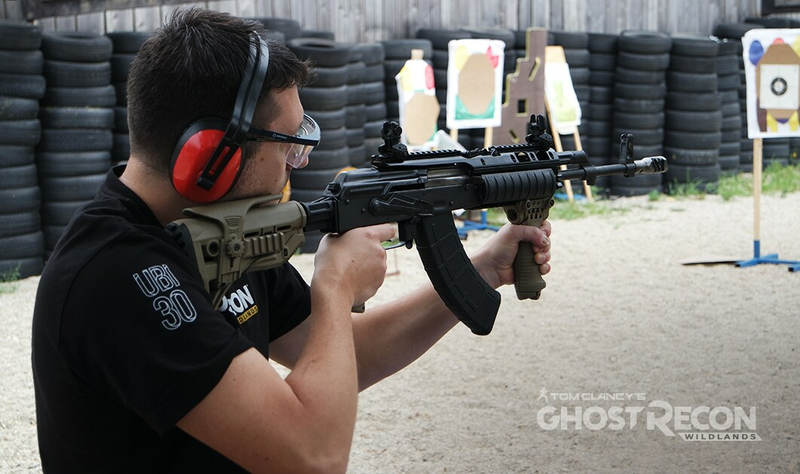 A Ghost Recon Wildlands team member tries out an assault rifle at the range. - And finally the “coolness factor,” which aims to determine if this weapon in interesting for the player, depending on its look and feel and the sound it makes. When combined, these three criteria ensure a coherence in the choice on the weapons that can be found in the game, both in terms of authenticity and fun. Once selected, the work on the weapon creation itself can finally begin. Many teams work at the same time to give life to a weapon. Each job family adds specific functionality to the 3D models, like pieces in a puzzle. The art teams handle all the visual aspects of the weapon: the modelers create the 3D model of the weapon, before adding the textures and visual effects. The animators generate the most realistic animation for each weapon, and collaborate with the programmers, who create the code for the weapon’s behaviors, by including the recoil and the AI behavior, among other things. Concurrently, the sound teams add sound effects, such as the gunshot and reloading sounds, and implement the sound propagation in the different environments of the open world (echo, reverberation, etc.). Next comes the testing phase. The weapon model is imported into the game editor, where the testers make sure the weapon is rendered correctly, that animations and handling are working fine, that the special effects are being played correctly, that the weapon is being showcased well in Gunsmith, etc. According to Mihai Zorca: “When looking at a weapon model, the first thing that you subconsciously notice is the proportions and the spaces. And I’m not only talking about the large main shapes of the weapon, but the hundreds of little details (screws, holes, indents, hinges, rings, locking mechanisms, etc.) that are each laid out with a certain technical or ergonomic purpose on a real weapon. Nothing is random! So we pay real close attention to these spaces and proportions when we create our models, and that gives us a solid and authentic working base.” Once the weapon is finally rendered in game, its model is sent to the weapon constructor for approval, in order to make sure authenticity is guaranteed. Since the release of Tom Clancy's Ghost Recon: Future Soldier®, many improvements have been made to the Gunsmith. Players will of course have more weapons to customize, and also more attachments that increase the gameplay possibilities. Mix in official licensed camo patterns and a very close preview of the weapon so you can enjoy all the small details, and you have a glimpse of the new Gunsmith. With the idea of giving more freedom to personalize the Ghost’s arsenal, you now have the option to paint each individual weapon part differently. This allows for more creativity and interesting color combinations to help you blend in better within the different environments of Bolivia. Another element the team is paying a lot of attention to is the signs of usage on the weapon materials. Bolivia’s harsh environments and the guerilla nature of the war against the cartel are taking their toll on the arsenal of the Ghosts, and the team developed a Dynamic Aging feature, which gradually simulates the effects of dust, powder, and grease on the weapon model and degrades the weapon’s coating the more you use it in-game. Dynamic Aging demonstration on three weapons, respectively M9, Stoner LMG A1 and P416. If you want to know more about the Gunsmith and its features, read our Gunsmith 101 article. Also, for a more detailed look on the different weapons that you will be able to find in the game, have a look at our latest article.